3 Bdrm/2 Bath at the base of Peak 8, walk to main st.
Beautiful renovated Summer of 2018 lux condo for your family offers a true vacation experience! Enjoy the beautiful Mountain/modern/farmhouse inspired decor with open concept design. Sit in front of the shiplap fireplace with a cocktail at the end of a day of skiing while gazing at the snow from the large open windows. Our space is perfect for your family gatherings with plenty of space for adults to sit and create memories, as well as a loft play area with play tent and toys for the kids. The two bathrooms have large spacious showers including a steam shower located in the master bathroom. Free wifi and Flat Screen TV with cable tv including HBO, Showtime and Netflix access. Full Kitchen with Granite Countertops, Refrigerator, Stove, Oven, Microwave, Toaster, Coffee Maker and everything you need to prepare your meals. Sawmill Creek condos are among the most conveniently located in Breckenridge. Ski in via the 4 o'clock ski run at the base of Peak 8, steps away from main St and the gondolas. 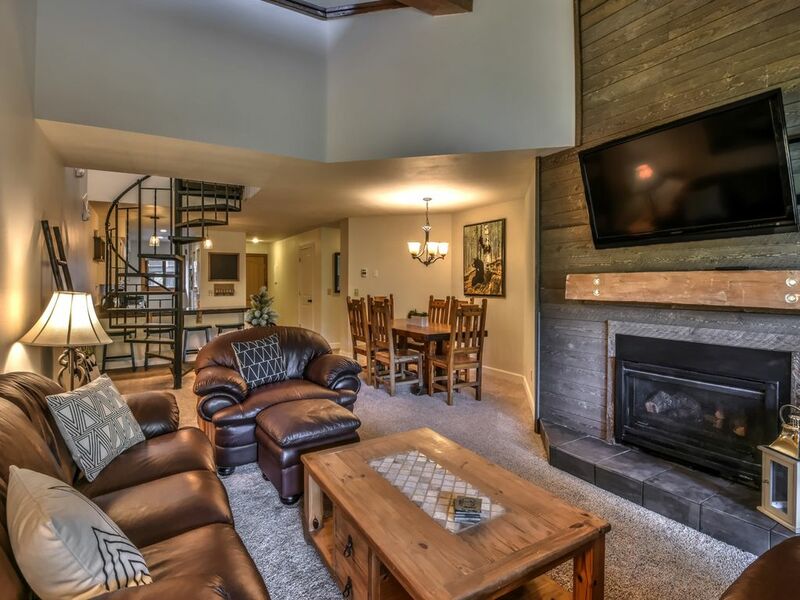 Enjoy the convenience of grabbing a quick coffee at Clint's in the morning, or skiing down Peak 8, into the condo for an easy lunch or into town to grab a bite! You can't find a better location than this for accessing both the slopes and the charming town of Breckenridge! We offer free covered parking for 1 vehicle and a private locked ski locker for your equipment. We accommodate families and multi family gatherings, however we do not rent to Bachelor/Bachelorette parties or large groups of adults. No smoking. No partying. No pets. Tawny and Nick Becker are residents of Denver, CO and purchased the condo in Breckenridge in 2008 as a second home. Both Tawny and Nick grew up in Colorado and love everything that the state has to offer including the great vibe, friendliness and outdoor lifestyle that makes our home special! We have 3 children whom we love to bring up to Breckenridge and create lasting family memories. We are big into yoga and outdoor activities- skiing and snowboarding in the winter, hiking, and biking in the summer. Breckenridge has so much to offer year round! The ski mountain is amazing, but it doesn't stop there. The town offers great food and shopping. There are all kinds of outdoor activities such as hiking, fly-fishing in the Blue River, mountain biking, boating on Lake Dillon, white water rafting, and more. While our condo has a plethora of favorable amenities, it was the location in the town of Breckenridge that caught out attention. It's at the end of the 4 o'clock run. It's located only two blocks away from the heart of main street. The blue river is 1 block away. The free town shuttle has a stop in both directions right in front of the building. Park your car and leave it the whole time you stay because you won't need to drive. One block walk from the condo to the new BreckConnect gondola. Strong Wifi signal in all areas of the condo. Recently refinished with granite counter tops. Plug in your iPod or iPhone to our iPod dock! The process to reserve was very easy and Tawny is great to work with! Our family enjoyed the convenience of the condo, we had everything we needed! The condo was clean, and perfect for our group. We will for sure look into scheduling another visit. I’ve been renting ski condos forever, and this one had all the bases covered. Great space, great location and well out-fitted. Will definitely come again! Truly in the heart of Breckenridge, easy ski-in at the end of the day. We enjoyed our visit so much we tried to book the same weekend in 2020 (already taken!). Tawny is easy to work with. Book this place! This condo is in a great location. It literally is at the bottom of the 4 o'clock run. Not just near it, but the run ends at the parking lot for the condo. Also, it is just a short walk, just a few blocks, from the gondola and main street. The condo is in relatively good condition, and we enjoyed the living room area for the adults to gather since there was a sofa, love seat and big arm chair. The loft area was good for kids to play in. The issues we had were that 2 days prior to arriving Tawny sent a message saying that her children had "hidden" the key to the ski equipment locker and could we please store our equipment in our car instead of being able to access the locker. Also, for a unit that says it sleeps 12, there are only 6 dinner plates, 7 dinner forks, and 8 bath towels. It is now 2 weeks after we returned and I have not yet received my security deposit back. This was my first experience with VRBO (or anything of this type) and having to wait this long makes me more likely to stay at a hotel in the future. Thank you for your review and feedback. Yes, our condo is in a fantastic location and was newly renovated and completed Fall of 2018. Right before the 2018/2019 ski season. The condo is in impeccable condition. Unfortunately our ski locker keys were misplaced by our children prior to your arrival. Thanks for understanding that sometimes things happen. I did notify Marcia ahead of time and gave her the options of either leaving her equipment in her car or putting them in our front hall closet. This seemed to me like a reasonable request until I could recover the missing keys. They have since been recovered! We market our unit towards families and typically do not rent to large adult groups. That said, the number of plates is adequate for 6 adults but we also have a large amount of kids plates available. I agree- some of the silverware had gone missing(this happens sometimes) and we added inventory a couple of weeks ago. We are constantly striving to improve our guest’s experience and had Marcia shared this feedback with us we would have gladly accommodated it for her. Since I am learning of her request on a public review- I have since added 6 additional plates and 6 additional forks. As far as towels go- For each rental, we notify our cleaning company what number of people will be in the unit and they provide towels accordingly. You clearly had more people than you told us. As far as your security deposit- that’s automated through VRBO and takes about 14 days. I believe that you may have been able to see that through reading through your information from VRBO. I would have also gladly shared that information with you, had you reached out to me directly. For some people the ease and space of a 3 bedroom/2bath home with full kitchen and washer/dryer far outweigh the constraints of a hotel. Especially with children. Our unit is brand new, with large bedrooms and living areas as well as an open floor plan. We have even created a play room in the loft for children. We have put in countless time and effort into creating "our happy place" for our family to enjoy. A brand new space with a killer location is a rarity in Breck unless you want to pay over 1,000/night. Marcia, it is disheartening to hear that rather than seeing what a gem you had you chose to fuss over little things like counting the exact number of plates, and forks. Perfect location. Close to town and gondola. The unit was quiet and had a spacious living area and bedrooms. Nice ski locker right outside unit. Easy access with elevator to 3rd floor. Really nice condo property, well stocked, and very convenient location. Visited with five college friends. The condo has plenty of beds and good sized living room for gathering. Very convenient to slopes, restaurants/shopping. Would recommend this place to friends. Hot tubs are communal but were always available. Nice, relaxed atmosphere. One small issue: no bathroom on the second floor.